Henri Poincaré (1854 - 1912) — looking as if he were stunned by his own discovery. In 1887 King Oscar II of Sweden and Norway offered a prize for the solution of an important maths problem. Suppose you have a number of celestial bodies (for example several planets and the Sun), and you know their masses and the speed and direction they are moving in at some given point in time. Their future motion is described by Newton's laws of motion and, since the bodies exert a gravitational pull on each other, by his universal law of gravitation. Use those laws to calculate the trajectories of the bodies. King Oscar's prize was won three years after it was launched, in 1890, by the French mathematician Henri Poincaré (1854 - 1912), who restricted himself to the case in which there are just three bodies. 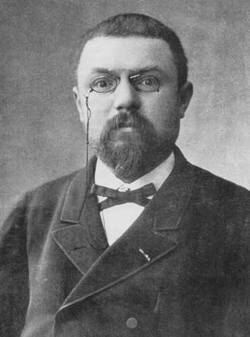 After winning the prize Poincaré discovered a major flaw in his argument, putting him in a rather embarrassing situation since his manuscript was to be published for the King's birthday within a few weeks' time. Honourably, Poincaré admitted his mistake and a new manuscript was published a year later. What Poincaré discovered in his feverish attempt to correct his work was that even this seemingly simple problem suffered from what is now called the butterfly effect, or, more technically, sensitive dependence on initial conditions. The smallest variation in the initial values (that is, the mass, location, speed and direction of motion of the bodies) can build up over time into huge discrepancies. You therefore can't reliably predict the motion of the planets over time because you can't possibly know the initial values with an infinite degree of accuracy. Poincaré later suggested that the phenomenon might be ubiquitous, arising in many other situations, including in meteorology. With the advent of computers, which enabled the many calculations that were necessary to make the effect apparent, it became clear that he was right. Unknowingly, Poincaré had laid the foundations of chaos theory. You can read more about chaos theory on Plus. But why, why didn't you tell that Poincaré discovered homoclinic tangle in process of this study?